When I first got clean the drug dreams came thick and fast. I would wake up just before I pushed down on the plunger, gasping for breath, sweating, desperately wishing it wasn’t a dream and that I could have one last hit. Sometimes I would even feel the shot go up my arm but I’d wake up before it hit my brain. Often upon awakening I would search the pockets of the clothes I’d been wearing in the dream. Freud’s conception of dreams as an outlet for repressed desires could hardly be more true. “Barely repressed” would be more accurate given my rampant urges to get out of that rehab and score. Sometimes the dreams seemed to play on particular fears or insecurities. In treatment centres relapse rates are often quoted by counsellors to give a kick up the arse and show how hard you have to work to stay clean. The first time I heard that about 90% of people relapse after rehab I felt alarmed. That night I had a dream. I was leaving the rehab and the manager gave me two bags of gear and a bottle of wine and said, “We know you’re going to relapse so you may as well get on with it”. In the dream I felt relieved and rather pleased- all my self-doubt and fear had been condoned and curtailed. I had been spared the struggle to stay clean. When I woke up I was struck by the bitter disappointment that followed every dream at that time in which I picked up but woke up before having the chance to tuck in. I resisted the urge to check my pockets. I actually felt a brief flash of “How dare he doubt me? I’ll show him,” indignation towards the dream manager, but this quickly gave way to resignation. “He’s probably right,” I thought. And I didn’t show him. The dream manager was right. In fact, I didn’t even make it out of the rehab before I relapsed. After a brief but painful struggle to stay clean I got some gear delivered in the post, used it, got caught and kicked out, which lead into a longer and more painful struggle to stay high. The dreams were not to blame for my relapse, but they did give an indicator of the state of my mind and my attitude to recovery. 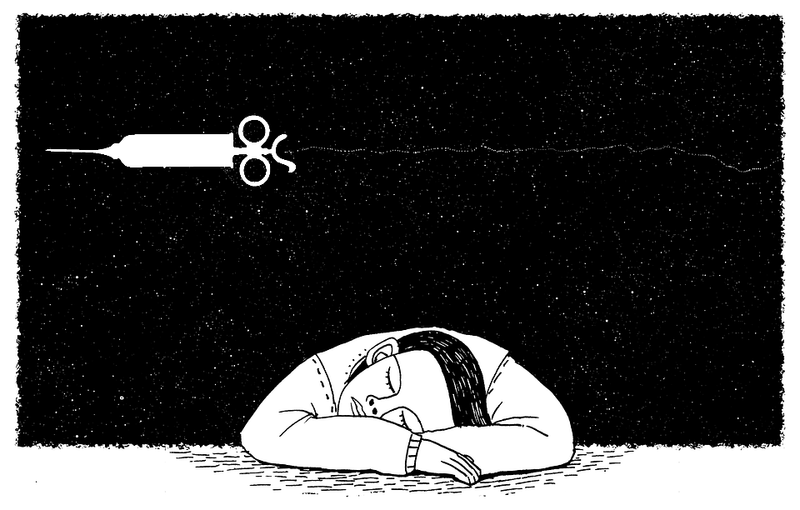 Is there any point in paying attention to dreams? Some psychiatrists would say dreams don’t mean anything; that they reflect the random firing of neurons. Others of the psychoanalytic persuasion would say dreams mean everything- they are the keys to our unconscious mind and the path to integration of various aspects of the Self. Even if you do accept that dreams hold meaning, dream interpretation is an ambiguous and controversial topic. Some suggest there’s a universal code of symbolism; that certain dream symbols have overlapping meanings for everyone, hence dream dictionaries. Others suggest that each person’s dreams function with a unique set of symbolism that can be decoded by them alone (perhaps with the help of an analyst). Drug using dreams transcend this ambiguity. They are powerful and direct and there’s no messing around with symbols. They follow patterns that reflect the trajectory of recovery and offer insights into it. They rarely occur when you’re using, they start when you stop, decline a few months into sobriety but may spike again for many years to come. Drug dreams tend to shift from drug using to drug refusing dreams after about half a year of sobriety. Jungian psychotherapist David Schoen broadly outlines three main types of drug dreams in his book The War of the Gods in Addiction; “Feels Great,” “Feels Awful” and somewhere in between. “Feels Great” using dreams are dominated by a “that feels good” or “that’s going to feel good” attitude to drugs. There’s no guilt or anxiety about using. Upon awakening the attitude is, “Ohhh that was nice”, or disappointment that it was only a dream. Schoen says that in early sobriety these dreams are a sign of struggles to commit to recovery or to let go of using. Occurring later in sobriety they are a warning sign of vulnerability. If a recovering addicted person I’m working with has a “Feels Great” using dream, I see it as a warning that he or she may be slipping back toward potentially using again. Usually they are starting to minimize, rationalize, or deny important aspects of their lives, including the reality that they are still addicted individuals. Sometimes stresses are building up in their lives, and they are being tempted to revert back to their old, familiar coping mechanisms of the addictive behaviors. Sometimes they have consciously or unconsciously begun to dismantle their support system and recovery program. In “Feels Awful” dreams, you feel guilty, disappointed, or anxious about using, or downright refuse to use. Upon awakening you feel relief it was only a dream. “Diagnostically it is a good sign that the ego-identity of the person is more committed to sobriety and recovery and less to the addiction,” writes Schoen. Claudio Colace, an Italian psychologist who specialises in addiction and sleep, describes drug dreams as a “thermometer of drug craving” in his book Drug Dreams. I’ve seen this canary in the coal mine concept at work. A friend I spoke to recently had been surprised by a drinking dream because he hadn’t had any cravings recently. On reflection, he realised he was feeling intense anxiety about an upcoming meeting and he would have always used drugs to cope with this in the past. Seeing this helped him to put other strategies in place to deal with the anxiety. Another pattern I noticed in the dreams of people I spoke to who had been clean about 3-9 months is a tendency to dream about drugs other than their primary drug of choice. They noted dreams about smoking weed and drinking. This is interesting because secondary drugs can be harder to relinquish a bit further down the line. It’s where reservations about sobriety often cluster, e.g. I’ll stop smoking crack but I’m still going to have some drinks from time to time, I won’t inject heroin but why not smoke weed? “Using dreams are a reminder to have a good thorough look at your relationship with drugs and alcohol,” says Luke Richardson, an addictions counsellor who specialises in dreams. Always journal. Firstly journal about the dream and its details; map it out. Then ask- does this relate to anything that’s been going on? For instance- at a year clean, an old using friend might appear on Facebook or something and could be a reminder about the past. Journal, map it out, and ask- is this related to the past, my current attitude, or somewhere I’m moving, or am I slacking in my recovery? And always ask: what is the emotion? If you can link it into the emotion- where is that emotion present in my day to day life- that is always a very helpful thing to do.